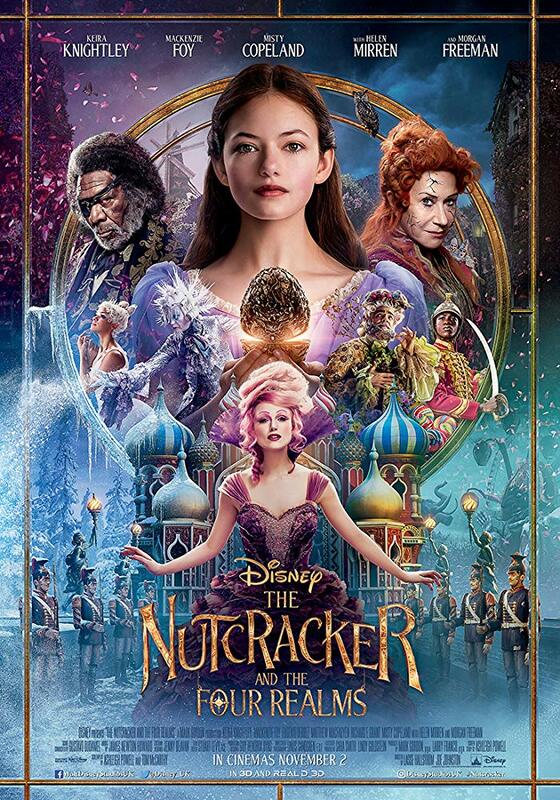 Movie: "The Nutcracker and the Four Realms"
Clara is led into a magical world while searching for a key that will open the lock on the last gift given to her by her deceased mother. However, the world she has stumbled into has been plunged into turmoil, and only Clara can restore order to the Four Realms. "The Nutcracker and the Four Realms" seems like a sweet confection that is expertly decorated on the surface, but when you cut it open, it's clear that it needed more time in the oven before it was fully cooked. This Disney live-action film is directed by Lasse Hallström for its principal photography, and the post-production while in reshoots was directed by Joe Johnston. The screenplay is written by Ashleigh Powell and is a re-imagining of the "Nutcracker Ballet" by Marius Petipa. It is also inspired by "The Nutcracker and the Mouse King" by E.T.A. Hoffmann. The story revolves around a science-minded, mechanically inclined young girl named Clara (Mackenzie Foy). It is Christmas Eve, and Clara and her two siblings, Louise (Elle Bamber) and Fritz (Tom Sweet), have just received one last gift from their mother, who recently passed away. Clara's gift is a silver egg that is locked, has no key, and comes with a note that says "inside is all you will ever need." Desperate to find the key, Clara seeks help and guidance from her godfather Drosselmeyer (Morgan Freeman), who is a clock-maker and is an expert on such things. During her godfather's gift hunting game, Clara is led into a magical world known as the Four Realms where she can find her key, learn her purpose, and may also have to save the kingdom while she's at it. Nothing says "Christmas Eve" like dead parents and incessant talk about gears! When it comes to live-action films, Disney has been struggling this year, though their subsidiaries are still propping them up nicely. 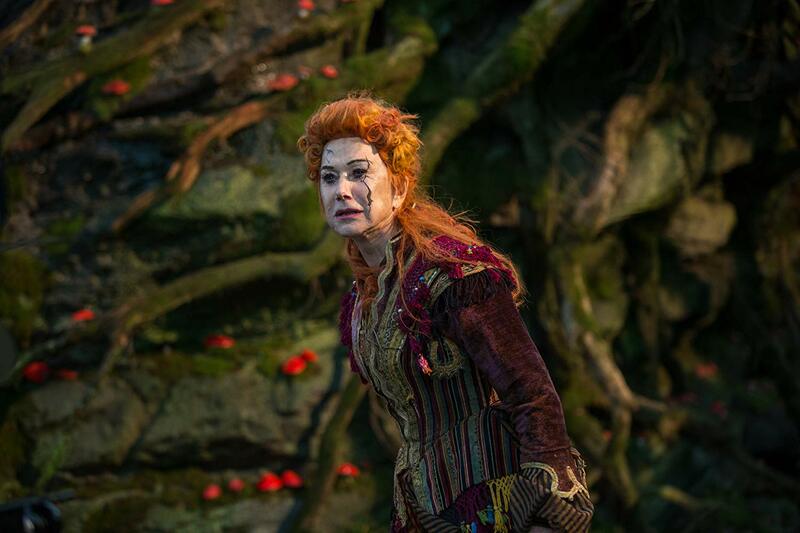 We thought "A Wrinkle in Time" would for sure be the worst thing Disney released this year, but "The Nutcracker and the Four Realms" sure gives it a run for its money. Oddly enough, this film and "A Wrinkle in Time" suffer from many of the same problems. 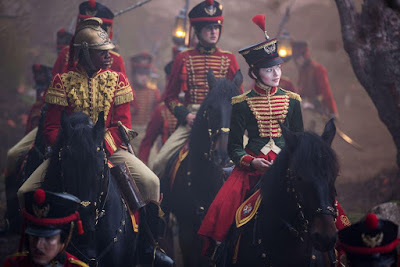 "The Nutcracker and the Four Realms" is a gorgeous film when it comes to its sets, costumes, hair, and makeup. There are some interesting ideas on display and a few homages to previous versions of the story, including a ballet sequence performed by Prima Ballerina Misty Copeland, which is 110% the best part of this movie, and an orchestral silhouette much like the one seen in "Fantasia," which played songs from "The Nutcracker Ballet." However, there is so much unnecessary excess when it comes to the characters and settings and plot points that its overstuffedness leads to its downfall. It is a visual smorgasbord, but despite the gluttonous aesthetic, the story and character development are anemic. So much of the film plays out the same recycled story we have seen time and time again in movies targeted to kids. We can appreciate Disney's efforts to make Clara the hero of her own story, but we wish they would have actually given her something with more depth and nuance rather than the same surface level shtick. The film boasts an ensemble cast with many talented performers like Dame Helen Mirren and Richard E. Grant, who are given nothing of note to do but stand around in weird costumes. These actors are only in this film so Disney could put their names on the posters and showcase them in the trailer. We have no idea who "The Nutcracker and the Four Realms" was made for. We have a hunch that most little kids will get restless, most teenagers will be bored, and most adults will be restless, bored, and will be scratching their heads in confusion while wondering the same things we did. This movie does not have a wide audience appeal in the slightest. While it looks like it was made for kids, there are some rather disturbing scenes involving clowns that pop out of each other like Russian nesting dolls, which could be considered either wonderful or horrible depending on your feelings towards clowns. Mother Ginger (Mirren) has a giant robot that looks exactly like her but in mega-ventriloquist form, and she chases Clara down as soon as she steps foot into the fourth realm. We're talking fever-dream, nightmare-inducing stuff here. 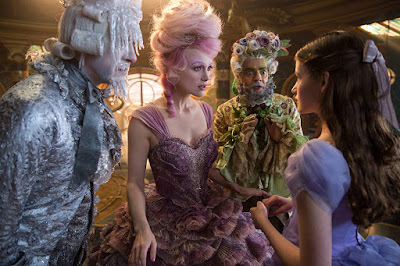 Despite its frilly, attractive packaging, "The Nutcracker and the Four Realms" is a hollow, surprisingly tedious, lackluster movie that will likely sink at the box office. There's some weird, dark stuff going on, and we were not on board with it as a whole. You should probably skip this one unless your kids really want to go (but then you should immediately question their decision making in the process).